Gentry is a quirky format in the way decks are made and the way people select their decks. Lets go over this briefly before we dive into a few deck that barely lost anything with the rotation. The deck building limitations Gentry imposes make decks that are build around a certain mechanic a lot better. The whole idea that a deck should be stronger that the sum of its parts is where Gentry decks are born. This is why they often don’t need the most expensive cards. The main exception are control decks, these often try to answer threats efficiently and only try to win once they have maneuvered into a position where they can’t lose anymore, when they do, they want to most resilient and strong threats the format has to offer. These mechanics or themes are often limited to blocks, 2-4 sets of cards that fit well together. In the current standard, this was always just 2 sets. Examples of such themes are Eldrazi, Allies, Werewolves and Delirium. Decks built around these kinds of synergies are in a large part what Gentry is about. People don’t choose their decks perfectly rationally. It is understandable that people want to play with the newest cards making decks centered around the new mechanics more popular than they should be. – I fully expect Dinosaur and Pirate decks to be the most popular choices for the next Gentry event – Unfortunately it happens that this causes ‘old’ decks to be forgotten quickly. BW Life drain with allies was a scary deck for its entire legality yet no one chose to champion the deck and Delirium was THE default control shell people build around but all that fell to the wayside when the UWR deck with a lot of ‘enter-the-battlefield’ creatures became popular. All of this means that people aren’t playing the best decks, but the decks they like the best. –which is perfectly fine– But that also means that decks can fall out of flavor and be forgotten. This article is to remind people there are still a bunch of decks that barely lost anything or even became better with the rotation and addition of Ixalan. Lets take a stroll on the beaches of Ixalan to look for survivors of the rotation. 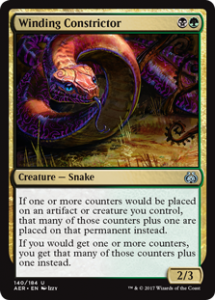 Winding Constrictor is still a recent card and was once the heart of “the best deck in standard” that pushed out GR Energy from that top spot. The entire metagame warped around the slightly slower environment that became prey to Control decks. Sean brought the deck to the Gentry Open and ran with it all the way into the finals where it lost against the deck that was designed to beat it. In his entire list he only loses Rabid Bite in the mainboard and Plummet in the sideboard (apparently Rabid Bite is in the welcome decks and therefor stays in Gentry). Crushing Canopy is already waiting to be a great replacement for the side board slot. Pounce in the meantime is a way to replace Rabid Bite in a way that offers less power on an equal playing field but more play-around potential for the deck. That is only looking at the newest cards, we still have Prey upon and Cartouche of Strength for fighting alternatives and Take Down and friends are ready to take out pesky airborn threats. It has taken leaderboard slots, Open titles and Invitational byes. For four months it was the undisputed “deck to beat” if you wanted to try a deck in Gentry. The format shifted and people forgot about the deck, everyone save Tim Mathys who took it to a top 4 spot in the Gentry Open and quintessential Grrrrrenergy champion Alan Schuer. Yes, it has lost Uncaged Fury and with that the ability to close out games it should have lost but there is still a potent cocktail. And now you even get the choice if you want to keep it completely Kaladesh centered or if you want to splash in some dinosaurs. Enigma Drake is an example of the tempo control Archetype. It plays control for a few turns then wants to drop a sizeable threat on the table and protect it for long enough to kill the opponent. It lost Dispel but got Opt and Spell Pierce instead which is a great upgrade for this deck that ideally wants to finish the match before Spell Pierce becomes irrelevant. They get a few other tempo tools as well in efficient bounce spells with upside in scry or treasure collecting. Accelerating into dropping big threats is a strategy that is always looming in the back of any format. That perfect cocktail between mana accellerants and big resilient threats is still there with Druid of the Cowl, Naga Vitalist, Oasis Ritualist, Arborback Stomper, and Sifter Wurm at the core of most decks. I expect sprinklings to complete conversions of Jurassic versions of the deck. Blue based control decks are here to stay, even if they will undergo some changes and adjust their plans. Losing Dispel and getting Spell Pierce instead means that they get better against all other decks in the early game but worse against eachother in the late game. Combine that with Rise from the tides no longer being there to force their opponents’ hand and we are looking at games that get drawn out a lot longer and rely more heavily on Rare and Mythics as game finishing threats. Black gets Duress to fight all this and that is why I fully expect the decks playing ‘hard’ control to at least splash black as a tertiary color. Right now there has not been a Gentry event but, as mentioned before, people have the tendency to play the recent cards decks that were entered in our deck site recently are mostly constructed by legal cards. In case you have doubts, check gatherer for legality. Is there nothing new in Ixalan? Oh dear soul, yes there is! There is so much to do in Ixalan that it deserves an article of its own. In the meantime, don’t hesitate to post your own decks on the decks.gentrymagic.com site for constructive discussion.